Although spring and summer are gone, there are a few plants still growing and blooming around our homeplace. If I find that something flourishes in a certain place, I’ll take pictures, so that I can remember where the plants are happiest. 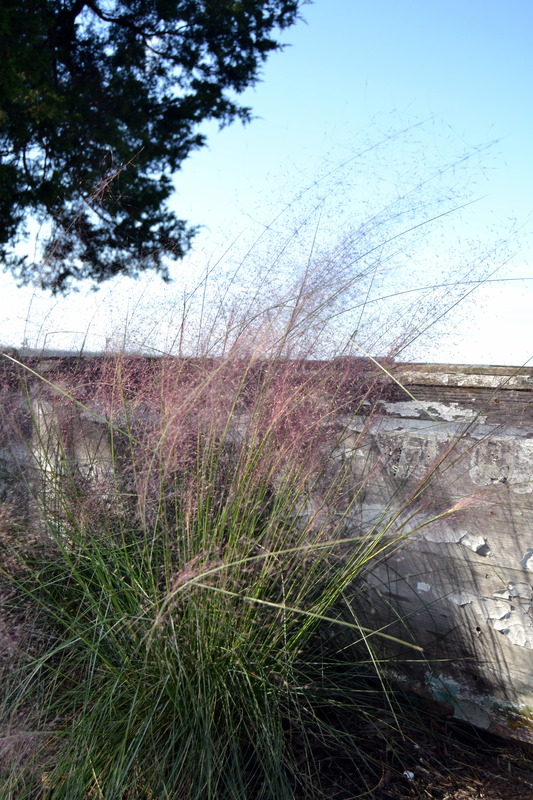 I’ve finally gotten muhly grass to survive through the summer, and now we have these beautiful wispy purple “blooms” out by the old boat. Now that it’s established, it shouldn’t need much attention. This sweet potato vine has been in the old wheelbarrow on the front porch all summer. It’s still putting on a show, competing now with yellow and orange mums. The celosia returns every year. Motor Man always comments on the bright red blooms. You may recall that, during the summer, I shared pictures of a black-eyed susan vine that reached the top of this trellis on our deck. I’m sorry to report that I neglected to water that for a few days, resulting in its untimely demise. Into its place, I moved this pot of HUGE coleus from another location in the yard. 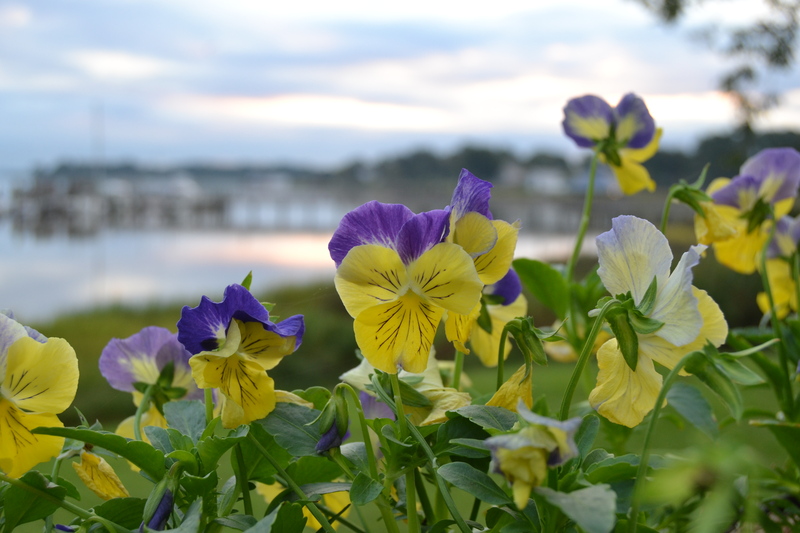 And, last but not least, the pansies I’ve planted in our window boxes on the deck are a yellow/lavender/purple combination. This year, I’m paying special attention to what plants/flowers are still doing well late in the season. Because….my friend’s son and his fiancee are planning to get married in our yard next September. And, you can be sure that I won’t forget to water the black-eyed susan vine next year. This entry was posted in Days at Home and tagged coleus, muhly grass, mum, pansies, sweet potato vine. Bookmark the permalink. Your yard was gorgeous when we saw it recently “up close and personal” – but it ALWAYS looks beautiful in your photos. 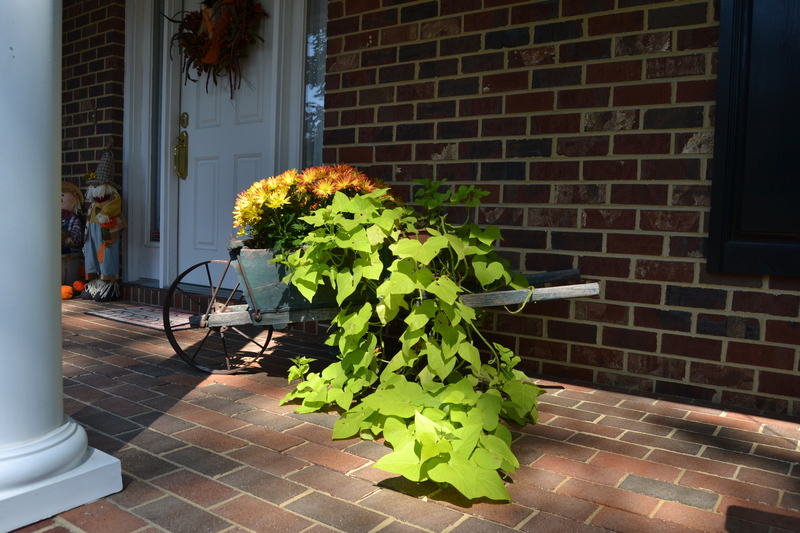 Everything seems to be happy in the locations you’ve chosen – the sweet potato vine looks so pretty trailing out of the wheelbarrow! It’s a transition time for gardens right now – yours is hanging in there beautifully! What a lovely late season at your place. You have such beautiful plants and flowers! I neglected quite a few of mine this year…fortunately over the years, I have replaced most of mine with ones that survive neglect! 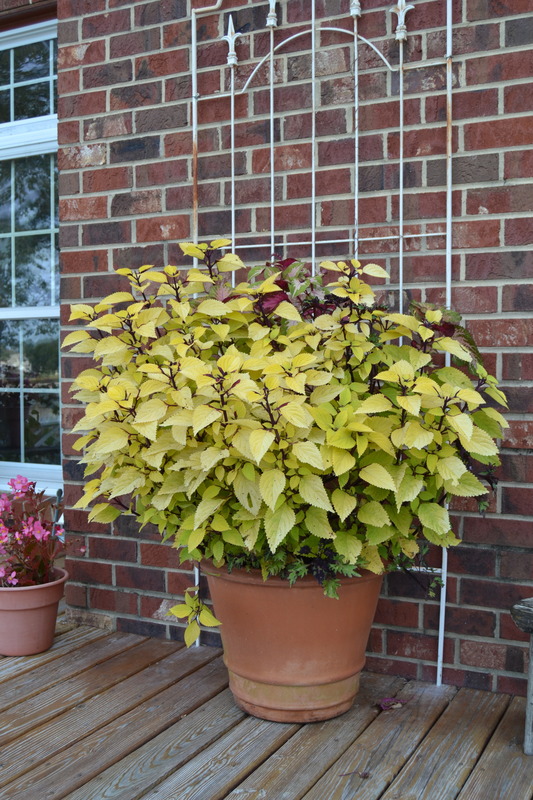 I love the sweet potato vine…and coleus have always been a favorite! Everything looks lovely! I adore that wheelbarrow and the plantings! Your green thumb is showing! Your yard always shines. i LOVE the red grasses! so pretty and natural! Such beautiful flowers!! And I’ve wished for a wheelbarrow! 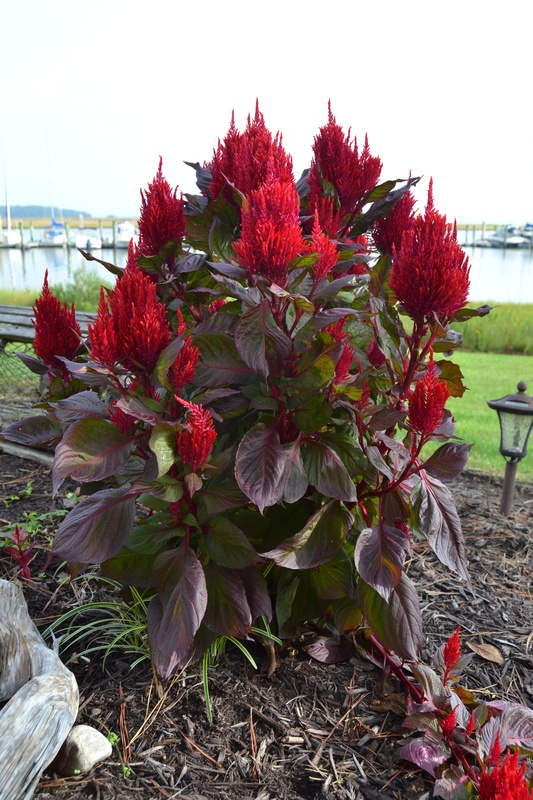 It’s been a long time since I’ve seen the celosia plant; it was called “Prince’s feather” around here. Could you post about your dolls in the baby bed? We’d love it! It looks beautiful there Dianna! Between the drought and the two freezes we have had we only have a pot of petunias left and a couple of ferns! A lovely garden tour! Thank you! Looks like your yard is always beautiful and colorful no matter the season. A lovely spot for the wedding for sure! Can’t wait to see those photos next year. The grass is a perfect accompaniment to the old boat. Nice color still. You have such a lovely spot in the world – inside and out. It matches your personality.